The Littlest Tea Critic and I had a special opportunity while visiting family up in Rochester, NY. 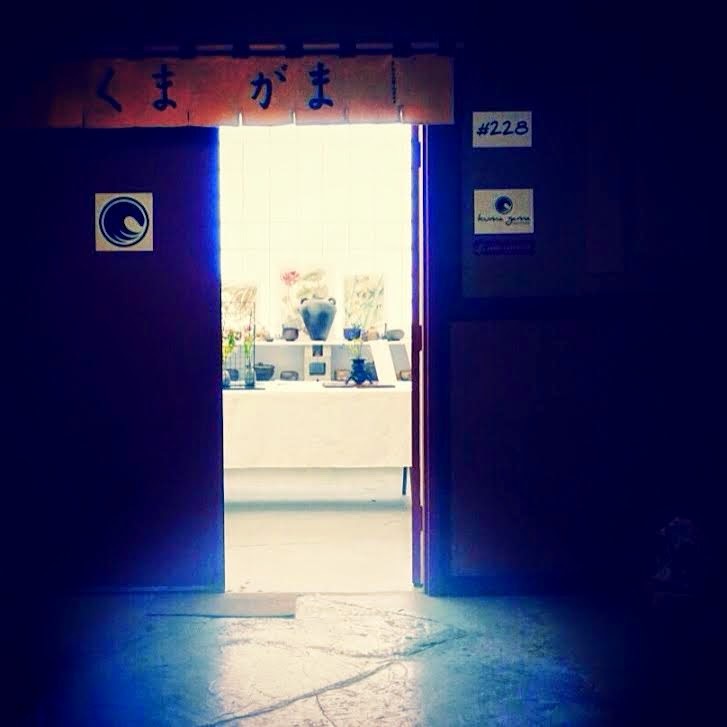 Enter an industrial building, walk up some stairs and you'll find long hallways with artists' studio doors. Walk through the labyrinth to the end, where you'll find a place that looks mysterious and magical. 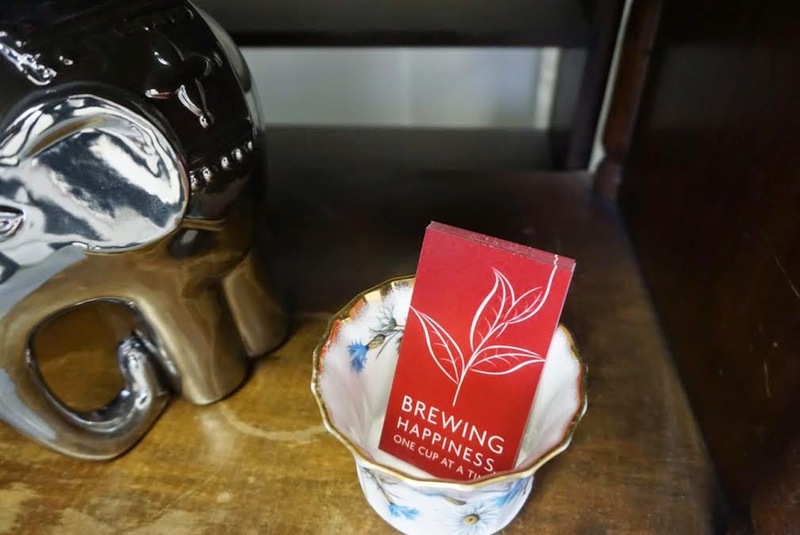 Enter inside to find beautiful flower arrangements, works of art, and Happy Earth Tea. Your host Niraj serves up samples of tea with a bright smile. Look around and you'll see beautiful objects. All handmade right in the studio by Cody Kroll. 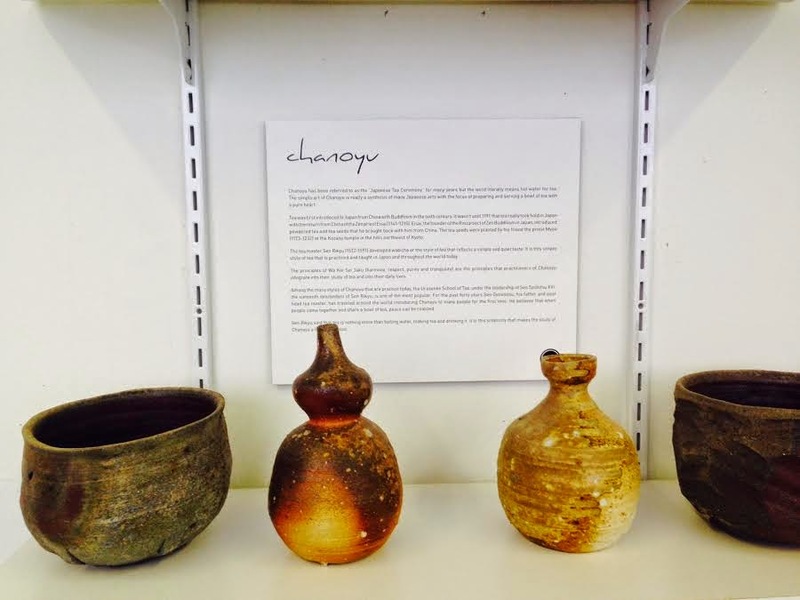 He uses Eastern pottery traditions and Buddhist philosophies in his art. 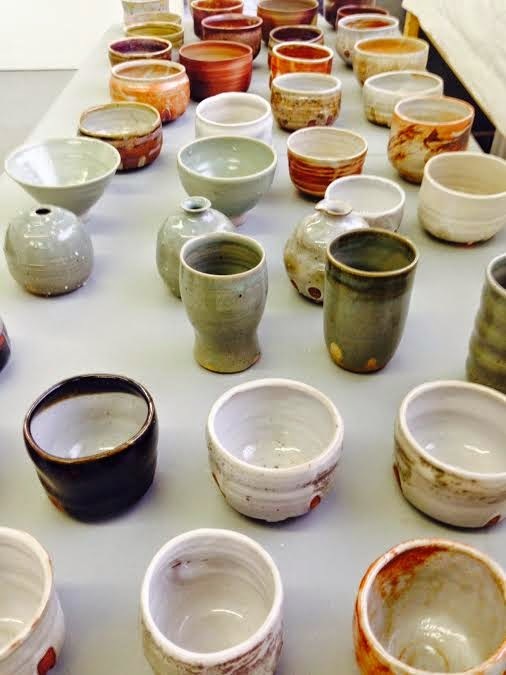 The chawan were so tempting, if I had more time to examine them I probably would have taken a few home with me. The colors and textures he creates have energy and emotion. The designs are extremely functional. 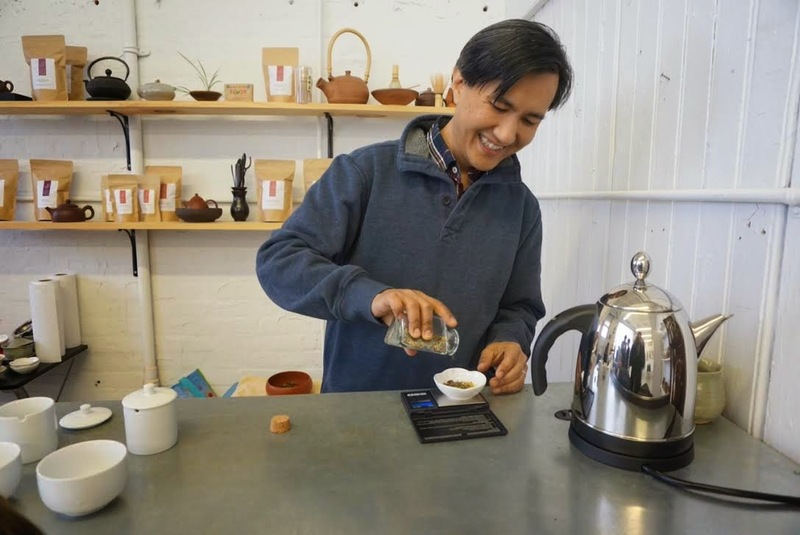 Niraj brewed a Gu Mu Lan purple puerh bud tea with us. The dry leaves were floral and surprising. We shared a few steeps of this tea that tasted of alfalfa fields and hay bales. 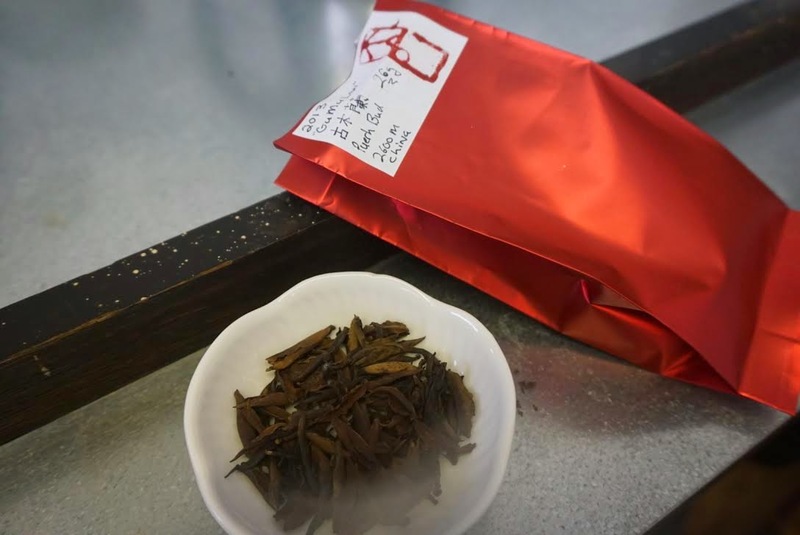 Each steep revealed new characteristics of flavor. The Littlest Tea Critic liked this tea, but I think she enjoyed serving it even more. She felt special as she was allowed to pour out the tea into our cups. I love that she savored each slurp, and asked for more. She was so interested in the teas that she asked to taste another she thought smelled delicious- the Jasmine pearls. Niraj brewed a little bit up for her, and I watched her taste and smile. Writing about tea has brought many positive adventures to my life, but my most favorite is meeting new people. All of the tea folk I've met are amazing people, and Niraj is no exception. Thank you so much for sharing your tea with us on a snowy upstate NY Sunday afternoon! 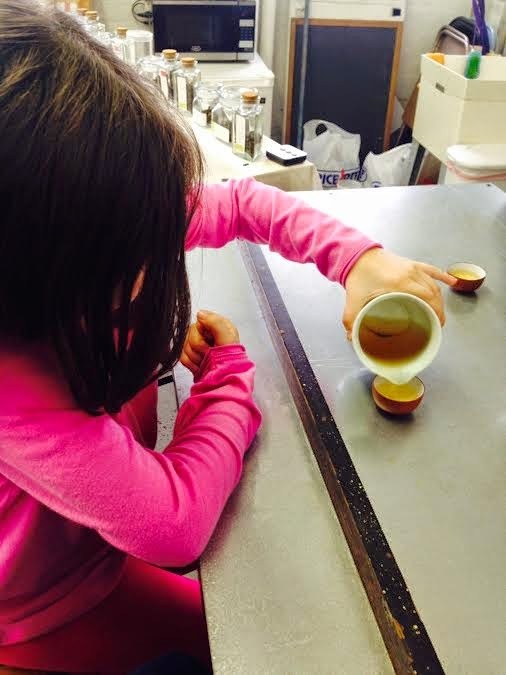 The Littlest Tea Critic is still talking about the time we had together. This sounds like a very special experience for you and the LTC, Sara! She has an adventurous palate to appreciate puerh.